It might be time to shift our focus? How to run 100 miles. A thing I have long wondered. I kinda want to do this race. "Know that everyone is doing the best they can with what they got, so get a bigger emotional toolbox to fix your problems." I needed to read this to catch the nuance I was missing. The Queen Victoria Poncy Spaniel. Eventually, the supporters of this administration will realize they will be eaten first. I will read anything Michael Lewis writes. This, however, is masterful. "The image of Prince up there, a purple hue all over the Dome, was really powerful. Frankly, I’d have admired Justin tremendously if he’d just sat down in the darkness for five minutes and let Prince have the stage all to himself, with no accompaniment, before picking up with perhaps a snippet of a cover and then the closing number. But I think we all know how willing Mr. Pop-and-Lock (tm Lainey) would be to let that happen. THAT would have been a tribute; what Justin diddo was just fancy karaoke that felt less about Prince and more about what he got to do with Prince. Some legends need no live accompaniment." - Go Fug Yourself on Justin Timberlake’s halftime show. Over at Another Mother Runner: I have had enough winter now. You used it for what? Otsego County People! Did you know about this? Judge not someone’s skincare regime. My first exposure to Skirt Sports was a random post about a kickstarter for a “Gotta Go” skirt, which was a skirt with compression shorties underneath that also had a flap for those moments when you just, um, gotta go. As a runner who has had more of those moments than I am comfortable sharing, I couldn’t resist. I followed along as Skirt Sports founder (and Ironman) Nicole DeBoom worked out the design. There were videos. The words “labial freedom” were used. I knew this was a company I’d love. Whenever the weather lets me, I run in their High Five, because it doesn’t ride up, looks cute, and has more pockets than even I know what to do with. I’m wearing it in the picture above, which was snapped by a great friend during the NYC marathon in 2016. I spent the first 14 mile of the race with a fleece hat jammed in one of the pockets, btw. You can see it in my left hand as I was about to hand it off to my daughter. 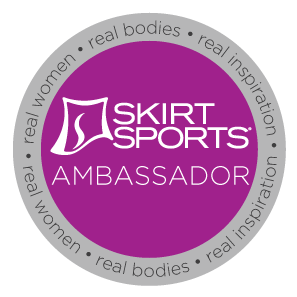 I thrilled and honored to be chosen to be a Skirt Sports Ambassador for 2018. It’s a company built by women who knows that #realwomenmove. It doesn’t matter if you are a pro athlete or a middle-to-back-of-the-pack’er. All you need to do is move. And, no, I’m not gonna be all Skirt Sports all the time. I just really do love the product, the company, and their moxie.